From birth children begin to learn about their world through their senses. Research even tells us that sensory play contributes to brain development. 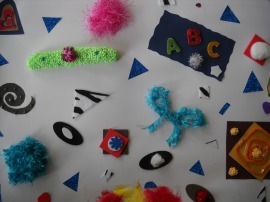 This lesson focuses on why caregivers need to provide sensory rich environments for children and challenges students to create a sensory toy for young children to explore and learn from. 11.4.12 A Analyze current research on existing theories in child development and its impact on parenting (e.g., Piaget, Erikson and prior finding versus new brain development research). 11.4.12 B Analyze current issues in health and safety at each stage of child development. Ask students to imagine they are entering a hotel room they’ve never been in before. What do you do? Most will tell you they “check it out” by exploring everything from the view to the comfort of the bed to locating various recreational and food attributes. We discuss that just as they explored their new surrounding so do infants and children. Young children explore and learn about their world their senses and motor actions. Read the article “Sensory Play: Early Exploration Through the Senses” and then assign questions for students to answer (see lesson below). Pass out pretzels or candy canes for students to explore using their senses for the last question. View a YouTube clip about a baby sensory class so students can see various activities being implemented with the young children. Then assign the Sensory Toy Project. Students will have a couple of days to research an idea using the internet/Pinterest, construct the toy/activity, fill out the form, and then bring it in for a class presentation. This way the projects are kept a surprise and you hopefully don’t have many duplicates. Finally students present them to the class, get to play or manipulate them and choose which project they feel is the best and most creative of the class. I am currently teaching this lesson to my students. It is going really well. I just introduced the sensory toy project, and my class of 22 girls seemed excited. 🙂 Thank you so much for another wonderful lesson plan. Your website has been a wonderful resource for me. I have done this lesson the past three years and it is always engaging and fun for the students. An excellent way to understand how a stimulating environment help children learn.